I just HAD to share this book with you, written by my friend Anne-Marie and her husband Jason. Oh my...I think it is the perfect little holiday surprise gift for someone you know! Anne-Marie is so creative and anything she touches looks like something out of a magazine! She is simple...yet elegant and her farmhouse is so lovely. This e-book is no exception! I loved it and devoured every page over a cup of tea! 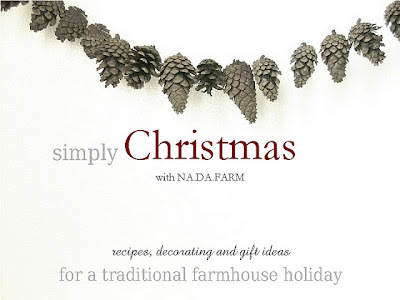 There are Christmas decorating ideas, recipes, and crafts. She also gives you a glimpse of how they celebrate Christmas on the farm. The best part is that it is only $2.99! Click on the picture to enjoy the book....click here to visit their shop filled with other beautiful handmade items:). They are having a huge sale! Have a great day filled with warm surprises! P.S. The "here" link does not take me to the shop. Hi Jody! Thanks for letting me know....I fixed the "HERE" link to Anne-Marie's shop!